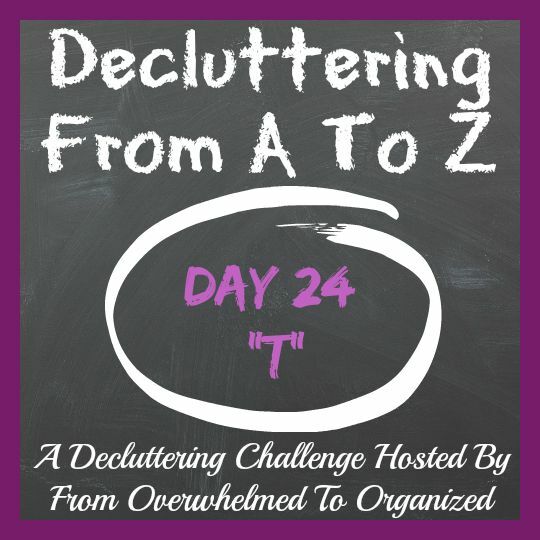 This month I'm hosting the Decluttering From A To Z challenge. It's a fun way to help you declutter items in your home that you may not have thought of decluttering. If you've missed any posts you can find them all here. Today we're decluttering items that begin with the letter T! You can declutter anything you want that begins with T. I'll share some ideas and you can choose any of them that resonate with you, or declutter your own ideas that begin with T. Join in the decluttering fun! and if you'd like a nice general all-encompassing category for today... just go with Things! Find a few of these things that you no longer need, use, love, or have the space to store (that's the definition of clutter by the way!) and let them go. Declutter "T" items today! And then share what you decluttered (see options below). 1. Sign up to receive my blog posts in your email inbox. You'll get a new post every day this month with the latest Decluttering From A To Z post. Once the challenge is over, you'll receive an email whenever a new blog post is published (usually 1-2 times per week). I share decluttering tips and other organizing tips on the blog. You can unsubscribe at any time and I won't spam you. I promise. 2. 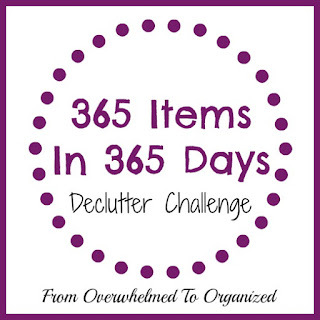 Join the 365 Items in 365 Days decluttering challenge! The Decluttering From A To Z challenge is really a challenge within a challenge. You can start the 365 Items in 365 Days challenge at any time and declutter whatever you want. More details here. There are details in that post about our great Facebook group too. 3. 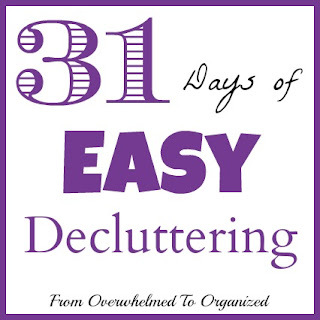 Check out my 31 Days of Easy Decluttering series. This was my 31 Days series from 2 years ago and each post gives tips to declutter different items or areas of your home. If you're focusing on certain areas of your home this month some of the posts may help you out. 4. Follow my Decluttering/Organizing Tips & Ideas board on Pinterest. This is my most popular board and I share tips there frequently. What are you decluttering today that begins with T? What T item is the hardest for you to let go of? What T things are the easiest to purge? Here are all the posts in this series!